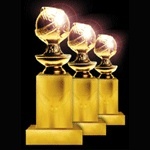 It's the wee hours of the morning on the East Coast, a chilling 5 AM on the West, and we're up to relay the lucky nominees for the 67th Annual Golden Globe Awards. There's a ton of speculation, a ton of hope, and now it's time to see who comes out on top ... er, who has the chance to come out on top. Stay right here and keep refreshing for the full list of hopefuls from Best Drama to Best Score, and weigh in below with your thoughts. The awards will air Sunday, January 17, 2010 on NBC. For more on the Golden Globes, head over to Moviefone.